Within the Yungdrung Bon tradition, there are three primary lineages of Dzogchen teachings. These teachings contain the highest and most advanced view and are found within the Ninth Way among the Nine Ways of Bon. One of these three lineages is called AH Ti, or The Guidance of AH. The founder of this tradition was the lama from the family lineage of Me’u named Gongdzo Ritropa. He is commonly referred to simply as Dampa, The Saint. Born in 1038 in the Shang area of Tibet, he was the oldest of four brothers. Although he was forced to marry at the age of eighteen, he left married life in search of spiritual teachings. He primarily received teachings from eight different lamas. Deciding that he would be of greater benefit as a monk, he requested ordination. So at the age of 24, he received the full monk’s vows. Following the advice of one of his lamas, he decided to spend his time as a reclusive practitioner rather than as a scholar. In Karpo Drak, he remained in solitary retreat for twelve years. He showed many signs of accomplishment such as flying through the air and leaving his hand and foot prints in stone. In addition to material that he collected from other sources, he added his own mind treasure to his teachings known as The Guidance of AH. He organized these dzogchen teachings into eighty practice sessions. In the 13th century, the holder of the lineage A Zha Lodro Gyaltsen condensed the number of practice sessions to thirty. 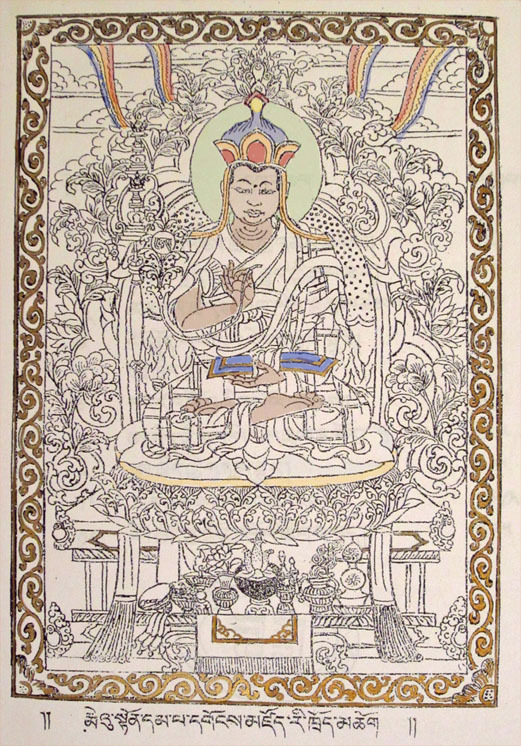 Later in the same century, the lama Dru Gyalwa Yungdrung further condensed the practice into fifteen sessions and composed the text The Guidance of AH in Fifteen Sessions. This text is widely used today among dzogchen practitioners. Posted on June 27, 2014, in Sacred Scriptures, Tibetan Culture & History, Tibetan Lamas, Uncategorized and tagged monks, sacred teachings, tibet, Tibetan history, Tibetan Texts, yungdrung bon. Bookmark the permalink. 3 Comments.